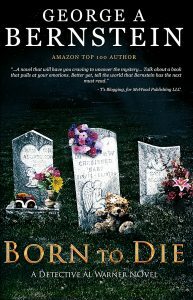 BORN TO DIE is my fourth novel and the second of my Detective Al Warner series, After writing DEATH'S ANGEL, I realized this could be the beginning of a great series, in the mode of Patterson's "Alex Cross." The stunning and violent surprise ending of DEATH'S ANGEL (no reader has ever guessed it) provided a challange on how to continue Warner's adventures, which I eventually crafted into another 5-Star novel that one professional reviewer called "One of the most masterful plots I've read in a long while"
Al Warner and his group of detectives and forensic experts are all carried over from DEATH'S ANGEL. The female protagonist, Casey Jannson, was someone I needed to be both a bit fragile emotionally, but with strong determination. Frankly, character makeup just sort of "comes to me" as I'm imagining the story. They start out as physical beings, but as the novel develops, they take over the action, changing and developing in ways I never first imagined. Soon they take the story down pathways not originally in my plan. It's an amazing experience to be led by the hand by characters of your own imagination through an unexpected maze. Rico Avila rubbed his eyes and stretched, bored by a day full of checking in petty criminals and answering nuisance calls. Just thirty minutes left before he could bug out and hoist a couple of cold ones at La Isla. A firm, authoritative voice, laced with stress… or maybe fear? Avilla hitched around in his swivel chair, sitting a little straighter, adjusting his headset over thick, curly hair. “When do you expect him?” The voice cracking, sounding desperate now. “Acting Chief of Detectives, Jack Harris.” Rico ran a finger down the directory, finding the right extension. “Yes sir. Just a moment, please.” He put the call on hold and buzzed the direct line in Detectives. “Right.” He switched lines. “I’ve got Detective Harris for you, sir,” making the connection. Terrific. Are you just guessing? And why are you calling homicide? The wiry little cop clicked his ballpoint, sliding over a pad of yellow lined paper. Kidnapped? Certainly a good candidate. A U.S. senator and a big time real estate magnet. Maybe our bailiwick after all. “I gotta ask, sir. Does she do any drugs?” Why is this always like pulling teeth? They want help but don’t give you anything to make it easier. Harris doodled on the lined pad, dissipating his frustration. Harris printed “ANN BARKER? ?” at the top of a fresh page, and then dropped the pen, with nothing else to add. The detective suppressed a groan. “But the public can be one of our best tools, if she’s just run off. Maybe a reward…? Jack Harris massaged the bridge of his considerable nose after hanging up. We’ll find her, alright. I just hope she’s still breathing. He rang the duty officer. They were chuckling as they hung up. Harris wished Al Warner were there. No one was better on the really tough cases. Warner was the sole reason that lunatic, Leordano, wasn’t still killing children, but it almost cost him his own life. If I hadn’t tracked him down in the ‘Glades that day… Lucky I got there in time. He sighed again. Jack was already working two cases, but they were about to take a back shelf to a missing teenager. U.S. senators got priority. The bawling had finally sputtered to a hiccupping stop. Shellie Laughlin cracked the door, peeking into the room. The night-light cast fractured shadows across the bars of the crib. Stevie had been unusually quiet for two hours. Always hungry lately, the little man should be demanding his meal by now. The incessant crying was driving her crazy. Had he finally gotten over the break-in last month? Strange that a five-month old could sense the danger. She tiptoed to his crib, never tiring of watching her new son, dreaming of his certain future in science or medicine. A little blonde angel, lying there on his back, so still. Almost too still. She touched his forehead. Gee, that’s strange. She put her hand back on his face. Was he too cool? Dropping the side of the crib, she leaned in, listening, but there was no sound. She put her ear close to his mouth. Still nothing. Shellie gathered him up, but he didn’t wake. His body was strangely slack. “John.” She turned toward the door, her infant son clutched against her breast. She stumbled from the room, hurrying for their study, where her neurosurgeon husband was reviewing files. He would know what to do. “Shellie, what is it?” He stood in the doorway, a cup of coffee in his hand. “It’s Stevie. Oh, God, it’s Stevie. Not a single damned place to eat alone. Shoulda had lunch at home. Casey Jansson dropped her change on her tray and surveyed the cafeteria. Most of the white laminate topped tables seating four to six eaters were occupied by visitors or staff. The room rippled with quiet voices, the muted clatter of dishes, and the pungent smell of overcooked cheese. Resigned, she approached a group of nurses and staff, clustered around a long, oblong mica table. Not eager to talk shop, she doubted it could be avoided. That’s what they did at lunch. They would draw her in, regardless of any effort to remain aloof. Still, these were her friends; she couldn’t just ignore them. She nodded to the two nurses, Rita from Delivery and Marcy from Pediatrics. Danny O’Brien, a second year resident, smiled through a two-day old red-stubbled jaw. His wrinkled blue smock, smudged with blood was a stark comparison to the nurses’ starched whites. “Join away,” Rita said, patting the empty seat. The diminutive but voluptuous, dusky-skinned woman was an utter contrast to Casey’s slim 5’8’’ slim Swedish blonde looks. “Always glad for some real company,” Danny said. “Hey.” Rita gave him a friendly elbow in the ribs. Danny laughed. “You look bushed, Rita. Busy shift?” Casey couldn’t help herself. “You always seem to end up with the celebs, though, don’t you, Sanchez?” Jack, an intern, said, grinning. “Huh?” Rita, her mouth full of spaghetti, frowned at the tall blonde. “I like where I am.” She brushed a lock of golden hair from her left eye, shifting on her hard plastic seat, suppressing the vision of Mikey, motionless and sprouting tubes and wires. Conversation stumbled to a nervous silence, like a pregnant woman awaiting the next contraction. Danny got things going again, but Casey drifted away. It was three years since she fell in love with little Mike Newman. Their five-month “affair” ended when he broke her heart, deserting her by dying after four weeks in a coma. Blinking away tears, she shuddered at the memory of his small six-year-old body, so cold and still. Her other love affair, with Mikey’s father, Andy, quickly deteriorated. She couldn’t bear to face him, and he never called. She had lied to them. She just knew Andy blamed her. Casey took a week’s leave, returning to St. Paul to visit her family. After three days of moping in bed, her mother dragged her out, organizing a party for twenty relatives and friends. Casey was commandeered to help with preparation and cooking. Predictably, her father went fishing. A true Swedish iceberg, he left dealing with feelings or any family problems to his wife. Casey understood her father’s reluctance to love openly. It was too easy to get hurt. Life with her family settled into some semblance of normality for the rest of the week, but a subtle numbness pervaded her. Struggling with the empty agony of loss, she erected an outward façade of quite reserve, burying her warmth and sensitivity under the appearance of a frosty, even snobbish Swede. In truth, she was shy. Once overcome by familiarity, she was the same warm friend little Mikey Newman had discovered. His father had learned she was also a passionate lover. But it all ended with the little guy’s death. Her heart got in the way of cool professionalism, and got shattered. After Mikey’s death, she resolved to remain distant, never chancing getting close to a patient… or a man… again. Maternity, where connections rarely last beyond two days, was the ideal solution. She blinked at the sound of her name, climbing out of the black pit of her memories. “Case? You okay?” Danny’s ice-blue eyes regarded her with a worried intensity. “What’s that, some kind of Irish wit?” She grinned at him. “Just trying to get a little juice back into that smile of yours.” They both laughed. “You’re good for me, Danny-boy.” The others were gone, returning to their assignments. “Oh, you nut.” She shook her head, her wheat-yellow hair swirling like a golden halo. His own special angel, Danny thought, as they went their separate ways.